Posted in: Radio Control, Team Losi Racing. Tagged: RC. I am a big fan of RC kits. There is something to be said about locking yourself away for a couple of hours, and building your vehicle from the ground up. You get to pick your own electronics. You really learn and understand how it works. It makes teardown and maintenance easier, and if there are any loose screws, you have no one to blame but yourself. 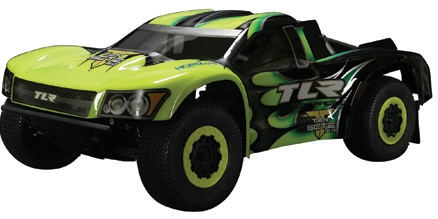 TLR (Team Losi Racing), a couple of months ago, announced their new release the TLR® 1/10 TEN-SCTE 4WD Race Short Course Truck Kit. This kit is due in stores within the next couple of weeks. Losi is a proven racing platform, with a lot of success on the national stage. If the 4WD is not for you, check out their 1/10 22SCT 2WD Race Truck Kit. UPDATE: TLR has just released a ready to compete version. This is great, if you don’t want to build your own.